Rewarding Times has teamed up with Roganstown Hotel and Country Club to offer you a 1 night stay for 2 people for just €159. Enjoy 1 night B&B for 2 with complimentary upgrade to an executive room and late check out and a 3 course dinner with specially selected house wine. This elegant country house hotel is located in picturesque grounds in North Dublin and is steeped in Georgian history. Set in 300 acres of mature landscaped gardens with 2 on-site championship golf courses, Roganstown offers peace and tranquility yet is only 25 minutes from Dublin city centre, and 5 minutes from Dublin Airport. This great offer includes 1 night bed & breakfast for 2 people in an executive room with full Irish breakfast and a late check out up to 2pm. You’ll also enjoy a 3 course table d'hôte dinner at the AA Rosette winning McLoughlin’s restaurant and a bottle of specially selected house wine. Roganstown is a magnificent example of a Georgian country house offering luxury accommodation at an affordable price and is located in the beautiful North Dublin countryside. One of the most romantic wedding venues in Dublin, with elegant bedrooms and stylish reception rooms, Roganstown is the perfect location for a wedding or celebration. 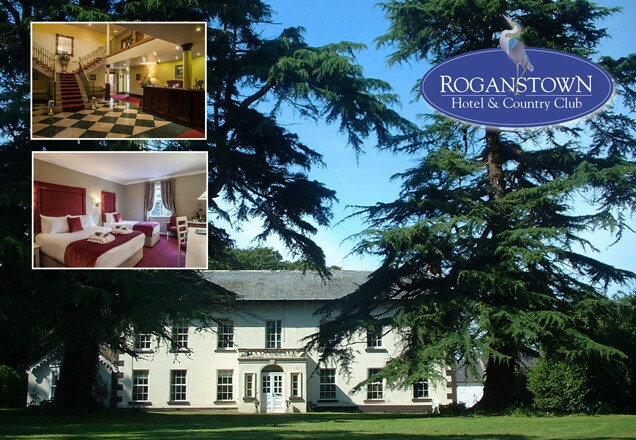 Roganstown boasts a state of the art leisure centre with indoor swimming pool, jacuzzi, steam room and sauna where you can relax or re-energize. If you’d like to enjoy some pampering during your stay, visit the Sakura Hair and Beauty Spa where highly trained therapists and hair stylists will be delighted to look after you. Vouchers are valid any day but are subject to availability. Bottle of selected house wine with dinner. Late checkout is until 2pm on day of departure.